Because of the operating frequency and beam orientation, Jicamarca is the only IS radar observatory to use Faraday rotation measurements routinely to obtain absolute electron densities to altitudes of a few hundred kilometers. These Faraday profiles are extended to high altitudes by fitting power profile information to them. Autocorrelation function (ACF) measurements at F-region altitudes are also done in a unique way at Jicamarca (Double pulse technique), at least at F-region altitudes. Orthogonally polarized (right and left circular) pulse pairs are transmitted with a cyclically varied separation to build up the ACF. Usually lags, including zero, are used. The short lags yield useful Faraday rotation information as well. An advantage of this technique is that it eliminates the clutter echoes that add to the noise associated with the usual single polarization double or multiple pulse transmission schemes used at other observatories. On the other hand, multiple pulse measurements are more efficient, statistically, especially when the signal to noise ratio is low. Unfortunately, multiple pulses cannot be used effectively for F-region measurements at Jicamarca because of extremely strong clutter interference generated by coherent scatter from the equatorial electrojet (EEJ) in the E-region. The details of the measurement procedures for density, and ACF profiles developed at Jicamarca in the early 1960s are discussed in Farley [1969 a , b , c ]. For the most part, these same procedures are still used today, the only change being that many of the original analog compensation schemes, designed to deal with various potential systematic errors, have been replaced with more accurate digital algorithms. This is particularly true for the Faraday rotation observations (J. Pingree, Ph. D. Thesis, Cornell University, 1990). The vastly increased computer power of today of course makes it possible to process and analyze the data in far more sophisticated ways than was possible in the past, and some of the ‘tricks’ (e.g. hybrid ACF calculations, multiplying via squaring and table lookups) used to get around computer limitations are no longer needed, but the basic procedures have not changed. Many years’ worth of temperature, density, and composition data collected with this technique are available for retrieval from the Web site at http://landau.geo.cornell.edu . Recently this mode has been upgraded to get daytime F-region vertical drifts from the so-called 150-km echoes [Aponte et al. 1997]. Nowadays, typical observing parameters are: IPP = 1500 km, Pulse width = 15 km, antenna pointing direction = 4.5o (used to be 3o ) (as time progresses the actual angles are getting smaller), sampling range=100-1400 km. One minute cross-correlation statistics are recorded in real time. 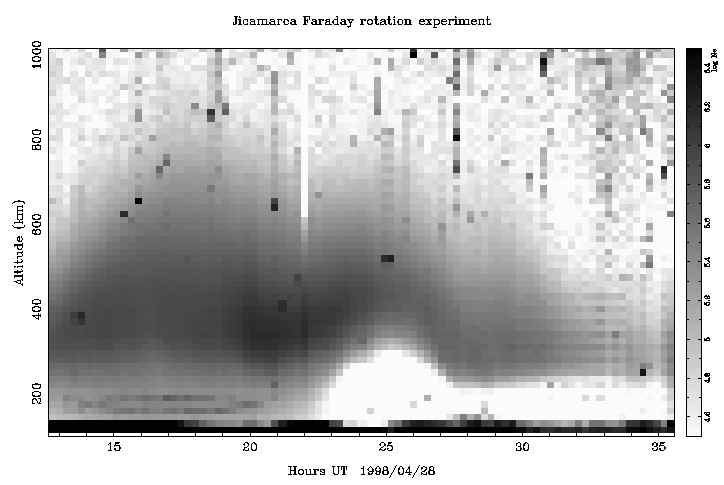 Quick ionospheric estimates are also obtained in real time every 15 minutes and a more refined processing is performed later (improved ground and EEJ clutter rejection and satellite cleaning).